Make it a point, do not un-install Folder Key Software and not to change the locked folder location before unlocking the folder with Folder Lock tool. No matter how many files and folders a user wishes to lock, there will be only one key to it. Thus, users do not have to take the burden of remembering multiple keys only for this folder lock software alone. However, in case of creating a locker, there is the provision within Folder Locker Tool of providing a separate key for each locker. In order to protect information within folder(s), you can now lock them with a password. Apply desirable password on multiple folders in your machine and make it restricted. No one can operate the folder key software until they don't have the password. Only owner of a protected folder can unlock it by using the respective password. With this option you can add multiple folders one by one and provide a password for each of them. Click on block command and the software will lock folders at once. Once protection gets applied on the file, you won't be able to access it unless you don't unblock it. 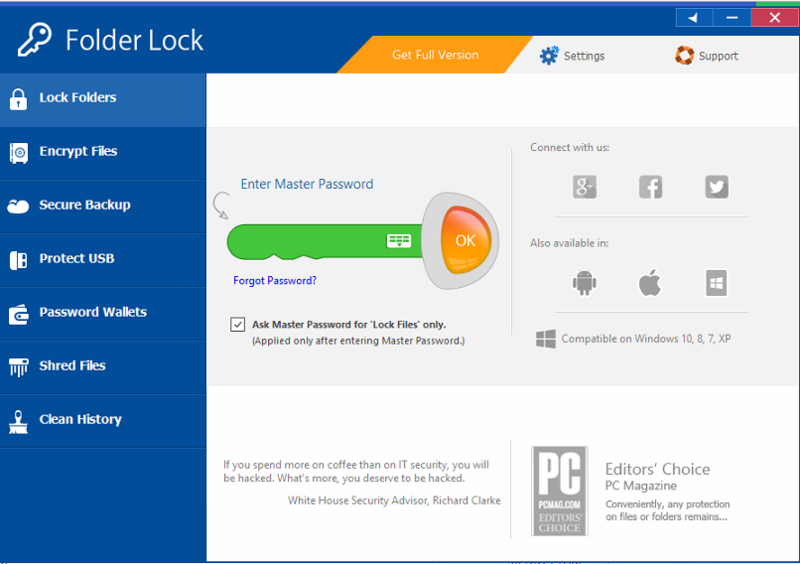 The Locker feature of this Folder Locking software comes with encryption-on-the-fly feature. It means that users do not need to manually encrypt and decrypt files with this folder Encrytion software. Once they add any file to the locker, it becomes encrypted automatically. After files get added in a locker, it becomes encrypted and no one can access them without password. Even if you secure your files by putting it in a locker, you can lose its possession to a thief. For such situations, online or cloud backup of data is mandatory. With the online backup feature within Folder Lock Tool, the encrypted locker can be saved in online as a backup. Users can retrieve their data from online if the data encounters theft or accidental deletion. Digitization in recent time has given rise to securing information in a safe place. Our everyday transactions, as well as credentials of different online and offline accounts should be stored in a safe place. Users can store all confidential passwords, pins, keys, etc., inside the Password Wallet within folder locker . Moreover, all data of this wallet are saved with encryption. With so many data recovery tools available, data deletion does not mean the full destruction of it. Deleted data recovery by unauthorized persons can cause severe problem to the original owner. Only shredding of files can ensure that your data will not fall into some wrong hands. File shredding feature of this Folder Locker Tool can do this job perfectly. If necessary, users can carry their lockers in USB pen drive or other external drives. Users do not need to install this Folder Locking software on every system they try to run the external drives. This necessity is gone as the utility turns the lockers into executable files. Attachment compression and DVD burning can also be done using this tool. Many of us regularly clear our browser history but do not pay attention to our OS history. This feature will help you to clean history of Windows programs as well as operating system. By removing temp files and clipboard data, the Folder Lock Software helps your system to perform faster and better. Can I use this Folder Lock Tool on Windows 10 system? Yes, you can easily run this Folder hide tool to lock folders, files , Drives on Windows 10. This program also supports to hide file & folders on Windows 8.1, 8, 7, Vista and XP. Do I have to set multiple passwords to protect all my folders? In order to lock/ hide any number of folders, only one master key will be used by Folder Locker Tool. Therefore, users do not have to remember multiple keys for locking multiple folders. Can I compress files through this Folder Locking software before sending as the email attachment? Yes, users can compress attachments before sending through this Folder Lock Tool. Besides, they can make the attachments password-protected using this program. How does the Protect USB Feature work? When some lockers or folders are added to an external drive or USB, this tool turns them into executable files. Therefore, you do not need to install the tool on every system you plug in the USB drive. Can we use this Folder Lock Software for data backup? Yes, this tool can also be used for online data backup. If the data gets lost or deleted, it can be recovered from online. Can this folder key software also Lock Folders on Windows 10? Does this folder security software protect folder with password ? 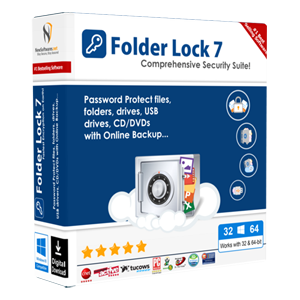 After searching for a reliable Folder Locker Tool for quite some time, I have come across this fascinating Folder Locking software . I do not worry about protecting my files from unauthorized access anymore. The application has taken the responsibility of protecting my folders and I can live a stress-free life now. I am so happy to find out this Folder Lock Tool that works perfectly to hide files and folders. Now I can share my laptop with my nephews without worrying about my project files. I thank the developers for creating this folder hide tool with so many useful and diverse features. This is the best Folder Lock Software in the market! The folder key software is so affordable that I presented it to three of my friends. They are also impressed with its performance and so am I. Now we do not have trouble keeping our folders hidden and secure.